It is 11 years since the FT's Business of Luxury Summit was held in Venice. Since that time the industry has undergone seismic change. In a country renowned for its luxury goods heritage, the Summit will discuss where next for the industry. How can the traditional houses innovate in order to keep ahead of the industry disruptors and remain competitive in the market? What does the millennial luxury consumer want and how is the way they are shopping changing the face of retail? How is Gen Z impacting the market and media landscape? And what can we learn from them? Co-chaired by the FT's Editor, Lionel Barber and Fashion Editor, Jo Ellison the Summit will bring together leading executives from the industry, innovators and financiers to debate the latest changes in the luxury narrative and what lies ahead. The Financial Times would like to thank everyone who attended and supported the 2018 Business of Luxury Summit. To see this years photos please follow this link. How are luxury brands developing to make themselves relevant in the 21st century? What different strategies are brands adopting and what are the success stories so far? Millennial spending is driving luxury growth. Wellness, health, travel and experience are the new buzz words. Who has cracked the market and how can we adapt to the new consumer spending habits. What does the luxury consumer want from their retail experience, what’s changing and what will the store of the future look like? Over a decade into launching his own business Erdem Moralioglu, Owner and Creative Director of Erdem is the name on everyone’s lips when it comes to elegant feminine styles, he talks with Jo Ellison, Fashion Editor, Financial Times on his visions for the future. Carrie Barber, ​Managing Director - Head of Global Luxury, Apparel and Beauty, ​Credit Suisse, Marco De Benedetti​, Managing Director, The Carlyle Group and Co-Head of Carlyle Europe Partners, Luigi de Vecchi, ​Chairman of Continental Europe for Corporate and Investment Banking, Citigroup and Elio Milantoni​, Partner, Head of M&A Advisory, Deloitte will discuss with Rachel Sanderson​, Milan Correspondent, Financial Times where the next industry big deals will come from and the outlook for the future. Giovanna Battaglia Engelbert is an Italian-born Creative Director and Consultant to luxury brands on their products and imagery, based in New York City and Stockholm. She is currently the Senior Fashion Editor at Vogue Japan and was previously Contributing Editor at W Magazine where she styled fashion editorials and also previously wrote a monthly column Gio’s Journal, which chronicled her latest fashion and art discoveries. In December 2017, Ms Engelbert launched her own e-commerce platform; www.myfavoritecolorisshopping.com a play on her infamous slogan, My favourite Colour Is from her best-selling first book Gio_graphy: Fun in Wild World of Fashion which was released in October 2017. Published by Rizzoli, Gio_Graphy is an elegant and colourful autobiography and style guide, a humorous and chic take on travel, fashion and living your most glamorous life, which pre-launched in the New York luxury department store Bergdorf Goodman. The launch saw Ms Engelbert design special window displays for the iconic Fifth Ave store, as well as designing a collection of exclusive t-shirts and curating her own pop-up store which hosted her book signing. Ms Engelbert has also used her artful styling and unique aesthetic in the role of creative director of the lavish cabaret show Queen of the Night, which ran from 2013 to 2016 in the revamped Diamond Horseshoe nightclub at the Paramount Hotel. Since entering the world of fashion at the age of 17, Ms Engelbert has worked as a fashion editor at L’Uomo Vogue under then editor in chief Anna Dello Russo; contributed to the stable of Conde Nast’s international publications such as Vogue Paris, Vogue Germany and Vogue China, and ran Vogue Gioiello and Vogue Pelle with Franca Sozzani, a position she held from 2009 to 2011. Cédric Charbit has been the Chief Executive Officer of Balenciaga since November 2016. Prior to this appointment, he worked at Yves Saint Laurent from 2012 to 2016 having joined as their product strategy director and later their merchandising director. In May 2016, he was named their executive VP of product and marketing. In 2009, Mr Charbit joined Yves Saint Laurent from Pucci in Italy, where he had held the position of associate purchasing director. He started his career in 2001 as a buyer with the luxury department of Printemps, where he held various positions until he was appointed Sales Associate Director. He is a graduate of the ESC Toulouse Business School. Gabriela Heart is the Founder and Creative Director of Gabriela Hearst. Born in Uruguay, Gabriela Hearst grew up on her family’s ranch surrounded by horses, cattle and sheep. After more than a decade spent in design in New York, Ms Hearst honoured her family’s heritage through the launch of her eponymous label in Fall 2015, as well as taking over the operations of her father’s ranch in Uruguay. Ms Hearst wanted to create a brand that reflects a slower pace and process: where things are made with care and detail, where tradition is more important than trend, where there is a purpose to every piece. Her commitment is to make a strong and modern collection without compromising her ethics and key values, taking into consideration where materials come from and who is making them: luxury with a conscience or in other words, “honest luxury”. Each garment is an item into which Ms Hearst can pour her desire — made with impeccable construction and uncompromising, noble materials. Together, they tell a story of the places she loves that made her who she is; Uruguay and New York. In 2016 Ms Hearst launched her Nina Bag which started as a limited-edition series bag and now has an extensive waiting list. She is the winner of the 2016/17 International Woolmark Prize for Womenswear and the 2018 recipient of the Pratt Institute Fashion Visionary Award. She was nominated in 2017 for the CFDA Swarovski Award for Emerging Talent and in March 2018 received a nomination for the CFDA Womenswear Designer of the Year. Ms Hearst attended the British School in Montevideo and studied Communications at the O.R.T. University of Uruguay. Alexandre Arnault is the Chief Executive Officer of Rimowa, the leading German high-end luggage manufacturer. The brand was founded in 1898 and has been part of the LVMH Group since January 2017 where Mr Arnault sourced the acquisition and worked on its completion. Prior to this role, he was involved with the LVMH Group through investment activities at Groupe Arnault focussing mostly in technology companies. Outside the LVMH Group, he has worked at McKinsey & Co and KKR in New York. Mr Arnault studied computer science at Telecom ParisTech and Ecole Polytechnique. Katharine Hamnett is the Fashion Designer of Katharine Hamnett London which was founded in 1979. Once established the company’s turnover grew rapidly and she was soon selling into the best shops in over 40 countries and was one of the first British designers to show in foreign capitals and license her brand in Japan. Ms Hamnett has held fashion shows in London, Paris, Milan, New York, Tokyo and Sao Paulo. She was the first person to give their first commercial jobs to many of the world’s top fashion photographers including Ellen von Unwerth, Juergen Teller, and Terry Richardson. She also launched the careers of many supermodels including Claudia Schiffer, Nadja Auermann, Naomi Campbell, both in advertising campaigns and on the catwalk to name but a few. According to market research she is viewed by the British Public as a ‘Bad girl with Integrity'. She is known equally for her menswear as her womenswear, launching many fashion trends, inventing the slogan T, charitable contributions on product, distressed denim, and making clothes that are fashionable but never go out of date. In 1989, she commissioned research into the social and environmental impact of the clothing and textile industry. Expecting to find nothing bad she instead found herself in a living nightmare: thousands of farmers and their families dying of accidental pesticide poisoning in cotton agriculture, and millions of people in the garmenting industry living in conditions worse than slavery. Desertification, contamination of ground water and sea, hideous problems to do with processing synthetics, wool and leather, and millions of tons of greenhouse gas emissions etc. This combined with a trip to Mali in West Africa in 2003 with Oxfam where she saw the plight of the farmers was her epiphany, and she committed from then on to only work with product that is produced ethically and as environmentally friendly as possible. During the period from 1989 to 2016 she attempted to change the fashion industry from within, got involved in many campaigns and lectured on sustainability all over the world. Ms Hamnett was appointed a CBE in the New Year Honours List in 2010 for services to the fashion industry. Ms Hamnett studied fashion at Saint Martin’s School of Art and on graduating went into business with her college friend Anne Buck under the Tuttabankem label. The partnership lasted 5 years. Since 1999, Harvey Spevak has driven the creative vision and led the strategic growth of Equinox Fitness Clubs and its portfolio of iconic lifestyle brands, first as CEO and President, and now as Executive Chairman and Managing Partner. In his role as Executive Chairman and Managing Partner, Mr. Spevak is responsible for fueling continued success, building long-term strategy and identifying growth opportunities for Equinox Fitness Clubs, which currently operates 92 global locations in the United States, London, Toronto and Vancouver, and for the Company's portfolio of brands, which include SoulCycle, Blink Fitness, Pure Yoga, Equinox Hotels, PROJECT by Equinox and E by Equinox. Mr Spevak has been the driving force behind the recent announcement of Equinox Hotels, which will open its first location in New York City in 2019. Conceived to offer an entirely new hotel experience to meet the needs of the high performance traveler, Equinox Hotels is poised for international growth. Mr Spevak is also the Executive Chairman of SoulCycle, a rapidly growing lifestyle brand that empowers its riders in a community driven fitness experience. Equinox acquired SoulCycle in May of 2011 and currently has 86 studios around the U.S. He also launched Blink Fitness in 2011, a brand of innovative, value oriented gyms, which now has 90 locations open or in development throughout New York, New Jersey, Pennsylvania and California. Mr Spevak also launched the first American outpost of Pure Yoga, Asia’s premiere yoga studio, which now has two locations in New York City. Mr Spevak is a member of the Ross School Advisory Board (RSAB) at the University of Michigan’s Stephen M. Ross School of Business. The RSAB plays an important role in helping craft the vision for the Stephen M. Ross School of Business, and serves to redefine business education at the world’s best business school. He is also on the board at The Shed, New York City’s newest center for artistic invention located in Hudson Yards. Mr Spevak contributes to several charitable organizations including Cycle for Survival, of which Equinox is a founding partner. He has been featured in numerous business, lifestyle and trade publications including the The New York Times, The Wall Street Journal, Financial Times, Bloomberg News, CNBC and CNN. Mr Spevak is a principal and board member of Motivate Bikeshare Holdings LLC, a global bike share operator, including Citi Bike in New York City. Diego Della Valle has been the Chairman and Chief Executive Officer of Tod’s S.p.A., the new Group he founded, since October 2000. Tod’s S.p.A. is now quoted on the Milan stock exchange and is a world leader in the luxury accessories sector. Its brands include Tod’s, Hogan, Fay and Roger Vivier. In 1996 Mr Della Valle was nominated Cavaliere del Lavoro and in 2000 he received a Honoris Causa Degree in Economics from the University of Ancona. Mr Della Valle has been on the board of several companies including Ferrari, RCS and Assicurazioni Generali. He is also on the board of LVMH, the international group of luxury goods. Mr Della Valle is a shareholder of RCS, Piaggio, Cinecittà, Fondo Charme, NTV Nuovo Trasporto Viaggiatori, Fondazione Umberto Veronesi and also of the football club ACF Fiorentina. Mr Della Valle is a member of the fundraising committee of the Umberto Veronesi Cancer Research Foundation and President of the Board of Directors of the Della Valle Foundation, a charity engaged in funding schooling for children. Together with Tod’s Group, Mr Della Valle has financed the important project of the restoration of the Colosseum. Paul Surridge has been the Creative Director of Roberto Cavalli since May 2017. The Spring/Summer 2018 women’s runway showed his official debut at the helm of the Roberto Cavalli brand. The British born designer is navigating the group through its next chapter which is facing the challenges of the radically transformed international markets with a clear determined vision. Prior to this role, Mr Surridge worked as a Creative Consultant for Acne Studio’s menswear collection. From 2011 to 2014 he was the Creative Director for Z Zegna. After working for Calvin Klein in the 1990s, he joined Christopher Bailey at Burberry, and later worked under Raf Simons at Jil Sander as the head of menswear. After graduating from Central Saint Martins, he has gained experience at luxury brands in New York, London, and Milan. Alexandra Van Houtte founded Tagwalk in 2016 after working as a stylist for publications including ELLE France, Grazia, Glamour, Numero and VOGUE Italia. Often spending hours researching designer looks, she created Tagwalk to give fashion professionals an efficient method of searching collections and provide key decision makers with live intel and data on current fashion weeks. Prior to working as a stylist, Ms Van Houtte studied Chinese at Nottingham University and Fashion Styling at the London College of Fashion and now divides her time between London and Paris, where her 11-strong team of analysts are based. At the age of just 28, Ms Van Houtte consults for world-renowned fashion groups and designers and has firmly cemented her position at the forefront of innovation and technology in the fashion industry. Nick Brown is co-Founder and co-Managing Partner at Imaginary Ventures, a venture fund investing in early-stage opportunities at the intersection of retail and technology. Mr Brown is co-Founder alongside Natalie Massenet, previously founder of Net-A-Porter. Prior to co-founding Imaginary Ventures, Mr Brown was a Partner at 14W Venture Partners from 2011 to 2017. 14W Venture Partners is a New York-based venture capital fund, focused on consumer technology in the e-commerce and fashion sectors. Mr Brown has built a career around backing direct-to-consumer brands that are challenging the modus operandi of retail incumbents. Whilst at 14W he led the firm’s investments in the initial financing rounds for some of today’s most exciting direct-to-consumer brands including Glossier, Goop, Everlane, Reformation, Outdoor Voices, Moda Operandi, Business of Fashion, The Real Real. He has a BA from Harvard University. Carrie Barber is a Managing Director in the Investment Banking division, based in New York. She is the Global Head of Luxury, Apparel and Beauty. As part of the Retail and Consumer Products group, she has coverage responsibility for a cross section of the group's verticals with a focus on the apparel and multi-branded retail sub-sectors. Since joining Credit Suisse a decade ago, Ms. Barber has played key roles in debt and equity capital raises and strategic M&A transactions with notable companies, including Tommy Hilfiger, PVH, Sally Beauty, Macy's, Neiman Marcus, Tumi, Urban Outfitters, SMCP, Canada Goose, Roots, Warby Parker, Lulus among others. Prior to joining Credit Suisse, Ms. Barber spent four years in consulting with Andersen Consulting. Ms. Barber received her B.S. in Chemical Engineering from University of Washington and her M.B.A. from Cornell's Johnson School, where she graduated with distinction. Sébastien Badault has acted as Managing Director of Alibaba France since November 2015 where he focuses on supporting the development of French companies to access the thriving Chinese market. In this position, his role is to connect consumers and merchants, particularly SMEs and large French companies, and help them seize the opportunities of trading and doing business in China. As Alibaba Group's International Director for Luxury and Fashion, he works closely with high-end and heritage brands cross-category, helping them navigate the exciting digital era of luxury in China. Within this position, he has been instrumental in the development of Alibaba's recently launched platform dedicated to luxury and fashion brands, the Luxury Pavilion. Mr Badault has extensive experience in managing operations for leading international web brands and e-commerce companies. Prior to joining Alibaba, he spent over ten years at Google, where he acted as commercial director, responsible for development in Southern and Eastern Europe, Middle East and Africa. Prior to this role, he worked as Director of European Development at Amazon, responsible for customer acquisition strategy and partnerships in the UK, Germany and France. He holds a Bachelor's degree in Science & Marketing from Boston College and a Master's degree in Marketing from the Ecole Supérieure de Commerce (ESC) in Toulouse. Alberto Galassi is Chief Executive Officer of the Ferretti Group, a world leader in the design, construction, and sale of motor yachts and ranging from 8 to 90 metres with a portfolio of seven iconic Italian brands including: Ferretti Yachts, Riva, Pershing, Itama, Mochi Craft, CRN and Custom Line. In addition to these brands, in February 2015, Ferretti Security & Defense was created as the Group’s business division dedicated to naval platforms for security and patrol missions. In late 2013, Mr Galassi was selected by the Weichai Group to join the Board of Directors of the Ferretti Group and in 2014 was appointed Chief Executive Officer of the Company. In June 2012, Mr Galassi joined the Board of Directors at Manchester City Football Club winning its first championship in the same year, 2012. Mr Galassi became a member of the Piaggio Aero Industries’ Board of Directors, responsible for Marketing and Sales in 1998. Piaggio Aero (now Piaggio Aerospace) is the only Italian private company active both in aircraft and aero engines, design, manufacturing and MRO. In 2008 Alberto Galassi was appointed as Chief Executive Officer of the Company and in 2014 was named Chairman of Piaggio Aerospace. Mr Galassi is an attorney at law, specialising in International Commerce and Arbitration at the UCLA University. From 1995 to 1997 Alberto Galassi held the position of Board Member delegate to Sales and Marketing at Novico, an industry leader producing medical and healthcare equipment. Erdem Moralioglu is the Owner and Creative Director of Erdem. Established in London in 2005 the designer ready-to-wear brand, has come to be synonymous with versatile yet powerful femininity. Founder Mr Moralioglu trained at the prestigious Royal College of Art in London where he remained to launch the brand following his graduation. Known for his use of experimental textiles, vibrant prints, and detailed craftsmanship, he has created a beautiful world of the delicate mixed with the bold. Mr Moralioglu has received numerous accolades over the years, including the 2008 British Fashion Council’s Fashion Forward Award, the 2010 inaugural Vogue/British Fashion Council Designer Fashion Fund Award, the 2012 British Fashion Council’s New Establishment Award, the 2013 British Fashion Council’s Red Carpet Award, the 2014 British Fashion Council’s Womenswear Designer of the Year Award, the 2015 British Fashion Council’s Establishment Designer award and most recently the 2016 Fashion Group International Fashion Star Award. His clothes are sold in over 170 of the most exclusive retailers, including Barneys New York, Bergdorf Goodman, Joyce, Dover Street Market, Selfridges and Harvey Nichols. After launching an e-commerce store in 2014, the brand opened its debut flagship store in London’s Mayfair in August 2015. Xia Ding is President of the Fashion Business for e-commerce giant JD.com, China’s largest retailer. As head of JD's fast growing fashion business, Ms Ding has full P&L responsibility for all fashion categories, including apparel and shoes, sports, luxury, bags & watches, and accessories. She leads a team of over 1000 people to drive business growth through building partnerships with global and local brands, formulating merchandising strategies on category mixes and fashion selections, as well as working with designers and fashion editors to ensure JD.com is the preferred fashion destination for Chinese consumers. Before joining JD in early 2017, Ms Ding was Vice President of Retail Solution at Nielsen, where she had responsibility for more than 700 online and offline retail accounts, including hypermarket chains, specialty stores and restaurants. In that role, she established strategic partnerships with global retailers and retail associations, and offered consulting services and solutions to improve retailers’ insights into Chinese shoppers and building their operational strengths. Prior to joining Nielsen, she worked at HanesBrands Inc. for 20 years in both the US and China, serving as Corporate Vice President and General Manager of Hanes China, where she led the launch and growth of the Hanes and Champion brands. Paul Andrew has been the Women’s Creative Director of Salvatore Ferragamo since October 2017 in charge of the brand’s ready-to-wear and accessories. Prior to this position in September 2016 he was named one of the first ever design directors for women’s shoes at Salvatore Ferragamo. The positioned followed his eponymous line of women’s shoes for Spring 2013 and the line of men’s shoes for Autumn 2016. The critical and commercial response to the brand has positioned Mr Andrew as an innovative rising force within the footwear industry. Mr Andrew has long been familiar with the rigor and discipline required to design for the world’s most discerning and fashionable consumers, he cultivated his craft alongside iconic fashion designers such as Donna Karan, Calvin Klein, Narciso Rodriguez and Alexander McQueen. Mr Andrew has been honoured with several awards since launching his brand these include; ‘Accessories Design of the Year’ at the 2013 edition of Who is on next?, the 2013 ‘Launch of the Year’ by Fairchild Publications and Footwear News, and the Top Honours of the 2014 CFDA/Vogue Fashion Fun. In 2016, Mr Andrew was awarded the ‘CFDA Swarovski Award for Accessory Design’ and the Ace Award for ‘Launch of the Year’ for his men’s collection. Janey Whiteside is the Executive Vice President & General Manager, Global Premium Products & Benefits at American Express. She began her career at Amex 20 years ago, and her experience spans global markets, diverse customer segments, and marketing disciplines. During her tenure, she has held marketing, product development/management, business development, sales and general management roles across international consumer, small business, network services, merchant services, travel & commercial payments. Ms Whiteside is widely regarded as a first-class marketer, product innovator, and incredible leader who inspires and empowers her teams to drive results. Known for her decisive, forward-looking and customer-first approach, she has established a strong followership and acts as a mentor and champion for people inside Amex as well as across the global marketing community. She was recently named one of Luxury Daily’s “Luxury Women to Watch” in 2018, as well as one of Ad Age’s “Women to Watch” and Brand Innovators’ “Top 100 Women in Brand Marketing” in 2017. An advocate for underprivileged and underserved communities, she leads by example through her work with local organisations including Citizens Schools and God’s Love We Deliver, and serves on the board of directors for the American Red Cross Greater New York chapter. Ms Whiteside is extremely passionate about helping entrepreneurs and actively mentors several small businesses. She recently joined the Advisory Board for Hella Company (Brooklyn, NY) and is actively involved in helping with the business’s marketing strategy & development. Marie-Claire Daveu was appointed Kering’s Chief Sustainability Officer and Head of International Institutional Affairs in 2012, and is a member of the company’s executive committee. She is responsible for the continued development of Kering’s sustainability strategy and the direction of the Group’s institutional affairs. Ms Daveu joined the company from the public sector where she served as chief of staff to French politician Nathalie Kosciusko-Morizet, within the Ministry of Ecology and other areas from 2007 to 2012. Prior to this, Ms Daveu was Senior Director of Sustainable Development at Sanofi-Aventis Group in 2005. She was previously technical adviser to the cabinet of Prime Minister Jean-Pierre Raffarin and Principal Private Secretary to Serge Lepeltier, Minister of Ecology and Sustainability. A French national, she is a graduate of the French National Institute of Agronomy Paris-Grignon, the École Nationale du Génie Rural des Eaux et Forêts (National School of Rural Water and Forestry Engineering). She also earned a Diplôme d’Etudes Supérieures Spécialisées (diploma of specialised higher studies) in public administration from Dauphine University, Paris. Simone Venturini is the Deputy Mayor of the City of Venice for Economic Development, Infrastructure, Work, Social Welfare, Health and Social Care, Youth, Relations with the City Council from 2015. Prior to this role he was the Former Councillor of the City Of Venice from 2010 to 2014. Whilst in this role, from 2012 to 2014 he held the position of Vice-President of the National Conference of Italian Municipal Councils. He holds law degree from the University of Padua. Mario Monti is President of Bocconi University. He was Prime Minister of Italy from November 2011 to April 2013 and Minister of Economy and Finance from November 2011 to July 2012. In November 2011, he was appointed Senator for life by the President of the Italian Republic, Giorgio Napolitano. He served for ten years as a member of the European Commission, in charge of the Internal Market, Financial Services and Tax Policy from 1995 to 1999, then of Competition from 1999 to 2004. Born in Varese, Italy, in 1943, he graduated from Bocconi University and pursued graduate studies at Yale University. Rachel Reavley is Vice President of Brand Strategy at Threads Styling. She is a highly experienced operator in the luxury fashion sector, consistently trailblazing the industry in publishing, content and commerce, brand and business building. Across 17 years at Conde Nast, she became the Associate Publisher of British Vogue, where she lead the highest decade of revenue growth for the publication, launching the Vogue app and developing the successful Vogue Festival brand extension. She also was Associate Publisher of Glamour Magazine where she established it as Europe’s largest selling women’s monthly magazine and developing the highly acclaimed inaugural Glamour Women of the Year Awards. Ms Reavley then joined Net-a-Porter.com in 2013 to become the company’s first Group Publisher, launching and building a successful new media and publishing business globally, this involved covering nine multimedia platforms including the launch of the world’s first, highly awarded, global and entirely shoppable luxury fashion magazine, Porter. She was nominated globally from across the industry as Publisher of the Year in 2015. She is now Vice President Brand Strategy of Threads Styling, an innovative luxury social commerce business, the first of its kind to market. Rapidly developing this pioneering and bespoke luxury service that leverages technology, creativity and social media (their work has seen the business become a government nominated Future Fifty business and is ranked no 32 in the Sunday Times Tech Track 100 in 2017). She has a love for the creativity of the fashion industry as a whole, as well as of interior design, art and photography. Marcantonio Brandolini D'Adda has been the Creative Director of LagunaB since 2015 and he is also the President of AUTONOMA, the new educational creative factory in Murano. He has transformed the image of LagunaB infusing it with his own personality, keeping all the previous collections and trying to attract new generations into such an old tradition and style. He created new designs, new vessels exhibited at David Gill Gallery and at Salone del Mobile. In September 2017, he had his first solo show at Alma Zevi Gallery, where he exhibited his latest glass sculptures. His main objective is to preserve the island of Murano as a strong production asset for his beloved city Venice, helping to raise awareness on its artistic heritage. In 2016, he partnered with the US based Pilchuck Glass School and established AUTONOMA, a creative factory that brings together the tradition and skills of the island with the creativity of the outsiders. Mr Brandolini D’Adda was born in Paris and raised in Venice. After studying in Switzerland and England, he decided to go back to his roots and take over and expand LagunaB, the artistic glass company founded and run by his late mother Marie. Mr Montezemolo is Chairman, founder and main shareholders of NTV (Nuovo Trasporto Viaggiatori), first European private high-speed railway company which this year transported 15 million passengers. He is also President of Telethon, the main Italian charity that aims to fund research on genetic diseases, and Chairman of Charme Capital Partners, International Fund of Private Equity. His career started in the seventies as Enzo Ferrari Assistant and Team Manager of the racing team. From 1992 to 2015 he was Chairman and Chief Executive Officer of Ferrari, winning 19 World Drivers and Constructors Formula One Championship whilst leading the company to the highest levels in the design, both in the industrial production and in competitions. Whilst in this role, Mr Montezemolo also served as Chairman of Fiat Group from 2004 to 2010 and as President of Confindustria from 2004 to 2008. He was the owner of Acqua di Parma Parfum and he has served for a long time as a member of the Board of Kering and Tod’s. He was also the General Director of the Organising Committee of the 1990 Italian World Cup Football Championship and President of FIEG (Italian Newspaper Publishers Association). He is a Cavaliere del Lavoro and in 2008 the President of the French Republic awarded him the title of Commandeur de la Légion d’Honneur. In 2002, he was elected as ‘Man of the Year’ by The Automobile, the US automobile magazine and by Autocar in the UK. He was nominated by Financial Times as one of the fifty best managers in the world in for three consecutive years from 2003 to 2005, and ‘European Manager of the Year’ for 2012 by the European Business Press Federation (EBP). In 2015, he was inducted in the Automotive Hall of Fame of Detroit, the most prestigious award of this sector, for his significant impact on the automotive industry. He was awarded with honorary degrees in Engineering and Industrial Design by many universities. Marco De Benedetti joined Carlyle in 2005 and is currently Managing Director of The Carlyle Group and Co-Head of Carlyle Europe Partners. He particularly focuses on the telecommunications and branded consumer goods sectors. Prior to joining Carlyle, Mr De Benedetti was the Chief Executive Officer of Telecom Italia. Mr De Benedetti was the Chief Executive Officer of Telecom Italia Mobile from 1999 until its merger with Telecom Italia. Mr. De Benedetti currently also serves on the boards of directors of Moncler SpA, Twin-Set Simona Barbieri SpA, Marelli Motori SpA, Comdata SpA, Logoplaste SA, Golden Goose srl, IRCA SpA, CIR SpA, Cofide SpA and GEDI S.p.A.
Edoardo Caovilla is the Chief Operating Officer and Creative Director of René Caovilla, representing the third generation running the company. He joined the company in 2009 as the Chief Operating Officer and in 2012 was appointed as the Creative Director of the brand. Whilst working alongside his father, Mr Caovilla has taken the company through a decisive transition to lead the René Caovilla brand towards new successes. His mission has always been rooted in the idea of taking a shoe company to the level of a worldwide luxurious accessory brand for the female market. Staying true to roots of the brand, while also maintaining and evolving the DNA, Mr Caovilla is pushing René Caovilla forward in the worldwide development of the stores’ network through multiple franchise openings; he is enhancing the selected brand presence in the wholesale channel and capitalising through globalisation. The export activities currently account for 90% of the sales, equally divided into the US, Middle East and Asian markets. With creativity running in his blood, like his father René Fernando who launched the brand in the 50s, Mr Caovilla creates precious styles while also adding a cool and contemporary touch. He is stretching the products range by reinforcing the importance of bags with the aim of introducing new categories such as bijoux in the near future. Mickey Riad is the Co-Owner of Fortuny Fabrics. Along with his brother Maury Riad, the family has been dedicated to protecting and nurturing the Fortuny legacy they were entrusted with. The brothers have served at the helm of this heritage brand for over 20 years, with Mickey as creative director and Maury as business and financial director after taking over operations of the Venetian textile company from their father in the mid-1990s. Together, they brought the 100-year-old firm online and into modernity, expanding design, sales and distribution. Against all odds, they grew and reshaped the business while keeping Fortuny’s soul intact. Fortuny textiles continue to be produced in the original factory on the island of Giudecca in Venice, on the original machines and using the same secret process and techniques as developed by Mariano Fortuny over a century ago. Philipp Gajzer is Managing Director of Move Now Luxury Brokers & Advisors and Managing Director of Move Now Commercial Brokers a German based company that provides transaction services for luxury retail real estate and advises some of the top players in the luxury market. After studying Medicine and Law in Frankfurt and Heidelberg Universities, Mr Gajzer co-founded the company in 2003 and led its international growth, with the company currently operating in Europe, Asia and US, procuring only in premium locations such as Avenue Montaigne in Paris, Bond Street in London, Canton Road in Hong Kong, Nanjing Xi Lu in Shanghai and Madison Avenue in New York. He works with the world’s most prestigious luxury brands, including Giorgio Armani, Bottega Veneta, Jimmy Choo, Harry Winston, Loro Piana and Prada. Tina Edmundson is Global Brand Officer and Luxury Portfolio Leader at Marriott International. In this role, Ms Edmundson oversees 30 diverse and experiential hotel brands, including a prestigious luxury portfolio that encompasses eight of the world’s most desirable and coveted luxury hotel brands; The Ritz-Carlton, Ritz-Carlton Reserve, BVLGARI Hotels & Resorts, St. Regis Hotels & Resorts, EDITION, The Luxury Collection, JW Marriott Hotels & Resorts and W Hotels Worldwide. Ms Edmundson plays a central role in the future development and sustainability of the company’s 30 hotel brands around the globe by re-defining and executing innovative, industry-leading and cutting-edge global brand strategies for the company’s expanded portfolio. Working closely with the company's global development team, Ms Edmundson is setting a new industry standard for creativity and innovation in experiential luxury and lifestyle travel. She plays a crucial role in helping ensure that each brand remains culturally relevant and resonates with the diverse and evolving mindsets of affluent guests around the world. Edgar Huber is President of Coty Luxury and a member of the Executive Committee. He oversees the division globally, which comprises the most powerful and contemporary-relevant portfolio in the luxury fragrance market (Calvin Klein, Gucci, Hugo Boss, Marc Jacobs, Burberry, Chloé, Bottega Veneta, Miu Miu, Tiffany, Davidoff, Joop, Jil Sander, Balenciaga, Alexander McQueen, Lacoste, Stella McCartney, Cerruti, Roberto Cavalli and Escada), as well as the holistic skincare brand philosophy and the anti-aging and suncare premium expert, Lancaster. He is responsible for brand performance across all regions and distribution channels, including travel retail. Mr Huber is an accomplished executive with over 25 years of experience in building global brands across the beauty and fashion industry. He spent 15 years at L'Oréal, the majority of which was in the L'Oréal Luxury Products Division, where he held positions of increasing responsibility, ultimately serving as President of the Division in the U.S. and Europe. Most recently he was President and Chief Executive Officer of Lands’ End, where he was responsible for driving growth and profit opportunities across all aspects of the business, and which was successfully introduced to the stock exchange in April 2014. He began his career at Mars Inc. as a brand manager. Mr Huber holds a Masters of Business Administration from the Wirtschaftsuniversität Wien (Vienna University of Economics and Business), Austria. In addition, he completed the International Management Program at HEC (Haute Etudes Commerciales) in Jouy-en-Josas, France and the CEDEP (General Management Program) at INSEAD in Fontainebleau, France. Lionel Barber has been editor of the Financial Times since November 2005. In his 32 years with the FT he has been US managing editor, editor of the European edition, news editor, Brussels bureau chief and Washington correspondent. In 2017 he was awarded the Legion d'Honneur for his contribution to journalism. For those who have pre-booked their transfer, we will have a FT Business of Luxury Summit welcome desk at the airport, located on your left as you enter Arrivals. Transfer time is approximately 40-45 minutes (to/from airport and Hilton) or 10 minutes (to/from Santa Lucia station and Hilton). Note that for those arriving on Sunday 20 May the airport transfer will be by car to Piazzale Roma, then by boat to the Hilton. This is due to the annual Vogalonga race through the city and lagoon of Venice. This shouldn't affect the transfer time. 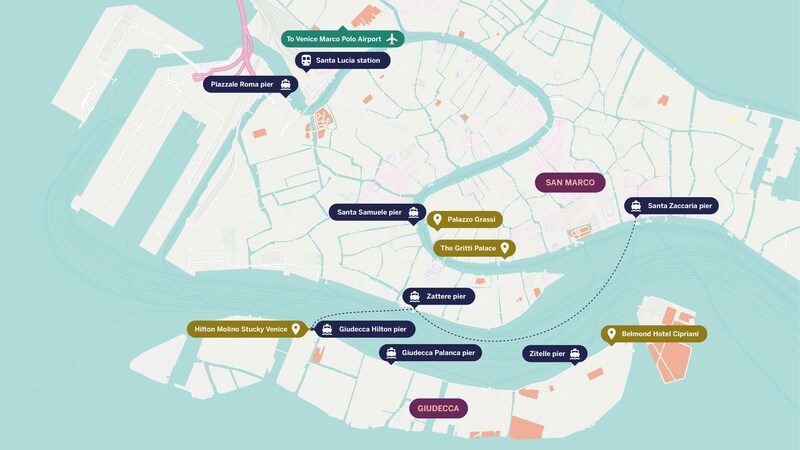 Hilton provides a shuttle service between Giudecca Hilton pier, Zattere pier and San Marco pier. There is also a 24-hour public waterbus. The timetables will be published here in April. Fully escorted private boats will depart from Hilton Molino Stucky from 18:00 - 19:00. At the end of the Reception return boat transportation will be provided back to Hilton Molino Stucky. Fully escorted private boats will depart from Hilton Molino Stucky from 18:30 - 19:30. At the end of the Dinner we will provide return boat transportation back to Hilton Molino Stucky. Financial Times has arranged very special rates for Summit attendees at the host hotel, Hilton Molino Stucky Venice. Rooms are on hold for FT Business of Luxury Summit delegates for the nights of 20 and 21 May. Rates are also available for the shoulder nights of 17, 18, 19, 22, 23 and 24 May. Note that availability for all nights is now very limited. Move now commercial brokers deliver custom made transaction services for luxury retail real estate on three continents. Ferretti Group is a world leader in the design, construction, and sale of motor yachts and vessels, with a unique portfolio of prestigious and exclusive brands: Ferretti Yachts, Riva, Pershing, Itama, Mochi Craft, CRN, and Custom Line. The Ferretti Group can boast 5 modern shipyards located across Italy, which combine the efficiency of industrial production with world-class craftsmanship and the heritage of Italy's centuries-old yachting tradition. Established in 1968, the Group is also present in the USA – through its subsidiary Ferretti Group America and in Asia, through its subsidiary Ferretti Group Asia Pacific Ltd. Moreover, a network of more than 60 selected dealers guarantees the Group’s presence in over 80 countries. The Ferretti Group has always been a leader in the pleasure boating industry, thanks to steady product and process innovation and the constant search for cutting-edge technological solutions. The wide range of available boats – flybridge, runabout, open, coupé, lobster boats, maxi and mega-yachts – is conceived by the Group's Product Strategy Committee fully committed to developing aesthetic and functionally innovative solutions, working in close cooperation with internationally renowned consulting boat designers. This is why the Ferretti Group's boats have always been known for their high levels of quality, safety, and outstanding performance at sea, as well as for the exclusivity of their design and the timeless appeal which make them so recognizable around the world. INTISARS is a fine jewellery brand founded by Sheikha Intisar AlSabah, a princess of the royal AlSabah family of Kuwait. INTISARS brings together Sheikha Intisar’s proud love for her Arabian heritage and Italian Craftsmanship to create jewellery that serves as Meaningful Reminders of Love. With collections crafted in Valenza, Italy using 18 karat gold and ethically sourced diamonds, all of INTISARS designs are created in a limited series of 50 pieces only. Available for purchase at exclusive trunk shows, and with a limited collection online, INTISARS is the perfect memento for women looking to connect with their jewellery on a more intrinsic level. DFS Group is the world’s leading luxury travel retailer, offering its customers a carefully curated selection of exceptional products from over 700 of the most desired brands, through duty free stores located in 11 major global airports and 20 downtown T Galleria locations. DFS is privately held and majority owned by the world’s largest luxury conglomerate LVMH, alongside DFS co-founder and shareholder Robert Miller. Secoo Holding Limited (“Secoo”) is Asia’s largest integrated online and offline shopping platform for premium products and services. Since our inception in 2008, we have attracted a large and loyal client base of more than 18M registered customers with high purchasing power and an increasing propensity to purchase luxury products and services. Secoo had gross sales of more than $800m in 2017, up 51% from 2016. We provide a wide selection of fully authenticated upscale products, offering more than 300,000 SKUs, covering over 3,000 global and domestic brands and, since 2014, high-end lifestyle services. Our online platform is complemented with 10 offline experience centres or theme experience stores in China and overseas. Humans of Fashion Foundation is a NGO to address and prevent sexual harassment, abuse, misconduct and assault in the fashion industry. The Humans of Fashion Foundation aims to achieve this by providing a platform, the HOFF App, to guide those who have experienced this type of abuse and connect them to pro-bono and subsidized legal professionals, counselors and support networks. The NGO was co-founded by fashion model Kristina Romanova and Juris Doctor, Antoniette Costa. Sewing New Patterns: The Fashion Leaders role in eliminating abuse and harassment. Can tech thread brand involvement and education to create an enhanced company culture? Hailed as the Times Up of the Fashion industry by Cosmopolitan Magazine, the NGO Humans of Fashion Foundation co-founders discuss anti-harassment policies, corporate code reform and education and how technology and artificial intelligence will change the industry. Antoniette Costa is Co-Founder of the Humans of Fashion Foundation. She is also a singer-songwriter, topping the Billboard Classical Crossover Charts in 2016 with her album “The Triptyq Sessions”, which featured Grammy Award winning cellist-beatboxer Kevin “K.O.” Olusola of Pentatonix as well as pianist and violinist, Tara Kamangar. Ms Costa also wrote the song “Void of a Legend”, which debuted #2 on the iTunes Classical Chart. She later produced the music video for this single, which went viral upon release. This song has since been covered internationally by bands such as the French trio L.E.J., and has garnered over 3 million views. In March 2018, Antoniette released the single “Find Another Girl” with rapper/model TK Wonder; part of the proceeds go towards the Humans of Fashion Foundation.Ms Costa graduated with the highest distinction from the University of Pennsylvania as an English major with a minor in Italian Studies. During her undergraduate degree, she studied Italian film, fashion, and art as part of her curriculum, developing a passion for the industry. In 2016, she earned a J.D. from Fordham Law School, selecting to concentrate her studies in Fashion Law. Here, she studied under Professor Susan Scafidi, the first Professor to offer a course in Fashion Law at an American law school, where she gained valuable insight into the legal frameworks surrounding the industry. Since graduating, Antoniette has worked in the legal departments of Louis Vuitton and the Yankees. Kristina Romanova is Co-Founder of the Humans of Fashion Foundation. Since 2010, Ms Romanova has been working internationally in high fashion, including contracts in Italy, France, and the United States. She is represented by Women Management (New York, Milan, Paris), Traffic (Spain), Elite (London) and has worked with high profile designers including Vera Wang, Ralph Lauren, Dolce & Gabbana, Calvin Klein, Marc Jacobs, Alexander McQueen amongst others. In addition to modelling, Kristina was the female cameo in Avicii’s music video “Wake Me Up”, which gained over 1 billion views since its release in 2013.Her passion for the fashion industry started when she was sixteen, during a visit to New York City. She was inspired by the vibrant nature of the city, and began learning about the fashion industry and the creative input behind it. Susan Scafidi is the first professor ever to offer a course in Fashion Law, and she is internationally recognized for her leadership in establishing the field. She has testified regarding the proposed extension of legal protection to fashion designs and continues to work actively with members of Congress and the fashion industry on this and other issues. Her additional areas of expertise encompass property, intellectual property, cultural property, international law, trusts & estates, and legal history. Professor Scafidi founded and directs the nonprofit Fashion Law Institute, which was established with the generous support and advice of the Council of Fashion Designers of America and its president, Diane von Furstenberg, and is located at Fordham Law School. Prior to teaching at Fordham, Professor Scafidi was a tenured member of both the law and history faculties at SMU, and she has taught at a number of other schools, including Yale, Georgetown, and Cardozo. Professor Scafidi is the author of Who Owns Culture? Appropriation and Authenticity in American Law (2005), as well as articles in the areas of intellectual property, cultural property, and of course fashion law. In addition, she has spoken to legal, design, and academic audiences around the globe and has contributed commentary to hundreds of media reports on issues related to law and the fashion industry. Professor Scafidi also created and maintains the first website on fashion law, Counterfeit Chic, which has been recognized as one of the American Bar Association’s top 100 blogs. After graduating from Duke University and the Yale Law School, she pursued graduate study in legal history at Berkeley and the University of Chicago and clerked for a distinguished legal historian, Judge Morris S. Arnold of the Eighth Circuit Court of Appeals. Ms Garrn is also involved in several entrepreneurial endeavors as an investor, such as the German and Jetlag startup “Jelite.” Parallel to all this, Ms Garrn has always had a strong interest in child protection and education, taking on an active role within Plan International’s efforts in Africa and even launching her own foundation in 2016. The Toni Garrn Foundation focuses on raising funds globally to ensure sustainable and safe education for girls all over Africa. The foundation’s largest fundraising example to date is the Supermodel Flea Market that Toni organizes herself worldwide, never losing track of her main philanthropic goal: Empowering girls globally to reach their dreams and know their rights. McArthurGlen Group is Europe’s leading owner, developer and manager of designer outlets, with a portfolio of 24 centres across Europe and Canada that includes the spectacular Noventa di Piave designer outlet near Venice. The group is currently developing its 25th centre – McArthurGlen Málaga – which will be the first designer outlet in southern Spain. We are able to provide first-rate consulting services. White understands the needs of brands that are synonymous with excellence, elegance and luxury. We are based in Munich and New York. Spanning all corners of the world, Marriott International Luxury Brands’ portfolio of luxury brands offers more than 385 luxury hotels and resorts in nearly 65 countries through The Ritz-Carlton, Ritz-Carlton Reserve, Bvlgari Hotels & Resorts, St. Regis Hotels & Resorts, EDITION, The Luxury Collection, JW Marriott and W Hotels Worldwide. Through these eight distinct brands, Marriott International presents a boundless network of unique travel experiences for today’s rapidly evolving luxury traveller.